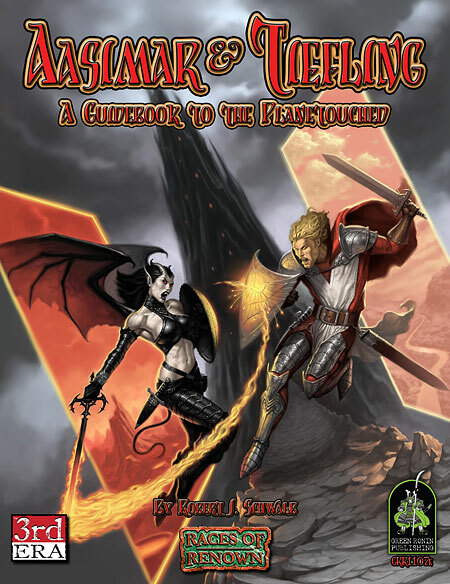 Bursting with new rules and options, Aasimar & Tiefling gives you all the tools needed to build and play planetouched characters and to take your campaign to the planes. Here are six of the amazing images by Britt Martin, Caleb Cleveland, James Ryman, Toren "MacBin" Atkinson, Jennifer Meyer, and Ilya Astrakhan that grace the pages of Aasimar & Tiefling. This PDF preview of Aasimar & Tiefling features two new planetouched races: Fetch and Jinx.